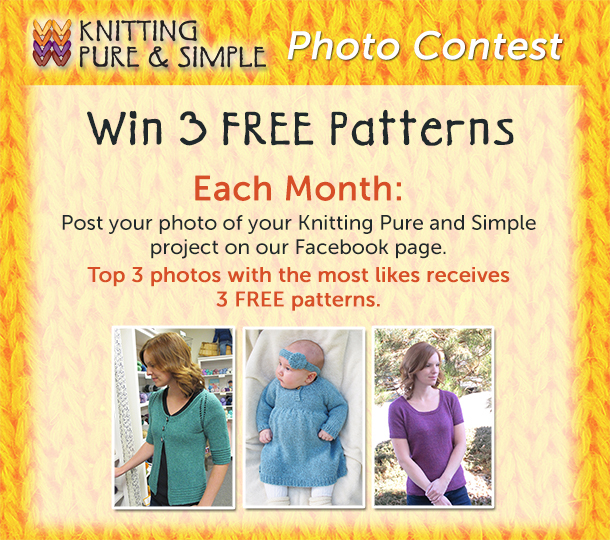 Want to win three free patterns from Knitting Pure and Simple? Each month we’re having a contest on Facebook* where knitters can submit their photos of their Knitting Pure and Simple patterns. Simply post your photo along with the pattern number by adding it on our Facebook wall. The top 3 knitters whose photos receive the most “likes” will receive 3 free KPS patterns. So get knitting and post your beautiful photos of your KPS projects today. * Please note our Facebook contest is in no way sponsored, endorsed or administered by, or associated with, Facebook.